Borderlinx | Buy Levis and ship worldwide with Borderlinx. Cheap rates guaranteed. During the Gold Rush era in San Francisco, Levi Strauss created Levi's USA and invented what became perhaps the most famous piece of apparel that ever existed, what we call "blue jeans." Ever since, Levi's USA has defined the way people wear jeans, and made their high quality denim a way of life. From cowboys to everyday modern life, for practicality, durability, and fashion, Levi's USA is a signature world-renowned brand making jeans for everyone. Levi's USA is most known for their blue jeans, but today they offer more than just the historic 501's. Levi's USA Men offers collections of pants, shorts, shirts, T-shirts, sweatshirts and sweaters, sweaters, accessories and shoes. Levi's USA Jeans collections' are composed of varieties of fits, cuts, colours, and rises for every type of man and woman. Thanks to Levi's USA, find exactly which style and fit suits your body best. From petites to tall to plus sizes, between straight cut, boot cut, demi curve, bold curve, Levi's USA Women makes jeans for all women. Levi's USA also makes quality apparel for kids. Most of Levi's USA jeans range between $48 and $78. 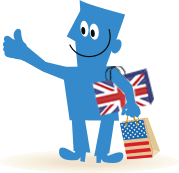 Shop Levi's USA products and ship to your home country with Borderlinx. You pay cheap international shipping, tax & duties upfront. You can calculate your tax & duty cost with our shipping cost calculator. A number of services are available through Borderlinx to make international ordering from Levi's USA hassle-free, including concierge, free repacking and consolidation services.